Polaris ATV Performance Parts - Where to Find the Best Deals. Polaris ATV performance parts are always some of the first things new owners think about buying. Once you get used to your new ride you start thinking - if only that clutch hooked up a little harder - if only I had just a little more power - if only the suspension was just a little smoother - if only the brakes stopped just a little shorter. Yeah - we've all been there! So what's the cure? There isn't one - you have to give in to the urge. Like Tim Allen used to say "More Power"! The trick is knowing which parts you need and where to find the best deals. That's where we come in. How to Find Great Deals on Hi-Performance Polaris ATV Parts. Polaris ATV Performance Parts Guide. Performance parts can enhance most Polaris ATVs if done right - but you can also end up with an ATV that performs worse if you use the wrong combination of parts! In this Guide we'll tell you about the ATV parts that work the best and the combinations that will give you the best performance gains for the money. Air Filter - High flow air filters and air boxes are a good way to gain some performance. But be careful if you ride in dusty areas - that gain in air flow can come at the expense of good filtering. A K & N type filter works well if you keep them oiled. A special "pre-filter" cover can be used in extremely dusty conditions. Exhaust System - You can always gain some power with a free flowing exhaust system. Aftermarket systems are usually lighter that stock so you can save a few pounds too. Don't think that more noise equals more power - a well engineered system can make more power without much more noise than stock. CDI Ignition - Hi performance electronic ignition box will change stock ignition curves and raise the rpm limit. If you don't use good quality fuel they can cause detonation and/or overheating. The higher rpm limit puts more responsibility on you not to over rev the engine, which could cause damage. Hi-performance Chip - The purpose of a performance chip is to allow modifications to the standard computer fuel map. This only works on models with electronic fuel injection. They can normally improve throttle response and smooth any "flat spots" out as the engine goes through its" rev range. One of the most popular Polaris ATV performance parts upgrades. Moderate gains in horsepower and torque are possible - but usually with the sacrifice of fuel mileage. Clutch - Kits to modify clutch performance are popular. They usually have different springs and weights to change the engagement characteristics of the clutch in a CVT type transmission. Most ATV clutch kits will improve acceleration at higher speeds but make the ATV more difficult to control at slow speeds. 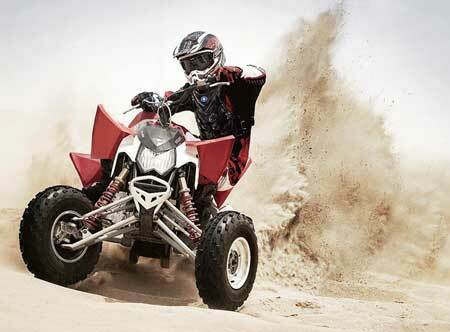 Suspension - Upgrading your shocks can make a dramatic improvement to the ride and handling of an ATV. They aren't cheap, but compared to buying another ATV they could be. Long travel kits are expensive and pretty complicated to install. They normally include replacement control arms, longer shocks, and extended cables and brake lines. They can provide a huge gain in overall performance with much better traction and handling. Brakes - The most common brake upgrade is high performance pads. If you're more serious there are upgrade kits with bigger rotors and calipers. As long as you're riding on dirt, I don't think anything like that should be necessary. This is one area where you don't gain much with Polaris ATV performance parts. Engine modifications - We're talking internal mods here. That's really something best left to experts. The most common mods are big bore piston kits and hi-performance cams. A big bore kit is a good way to get more power without sacrificing rideability. Cams will usually move the power band higher in the rev range at the sacrifice of low end power. The link above will take you to our customized listings for Polaris ATV performance parts at Ebay Motors. We think the best deals can be found there. Plus you can read the customer reviews and ratings to make sure the parts will do what you expect. Stick with the highest rated sellers and you shouldn't have any problems. All high performance Polaris ATV parts can be found under this listing. You can narrow your search down by using the "Part Type" drop down box to the left of the listings. Just make your selection and click the "Go" button.